Boeing and Saab have proven that Boeing’s Small Diameter Bomb I (SDB I), originally developed for use by aircraft, can be adapted for launch from a ground artillery system. The companies recently tested the Ground Launched Small Diameter Bomb (GLSDB), integrating the SDB I and M26 rocket motor technologies for the Multiple Launch Rocket System. The testing showed that the bomb can withstand a rocket artillery launch without its performance being compromised. «GLSDB combines two highly successful, combat-proven systems into an effective ground forces offensive capability», said Beth Kluba, vice president, Boeing Weapons and Missile Systems. «Boeing and Saab bring together deep knowledge of precision weapon systems and can quickly and cost-effectively deliver GLSDB domestically and around the world. Moreover, this is not developmental, it’s not PowerPoint. It’ hardware, it exists, and through our investment we’re able to bring this capability to the war fighter very quickly». GLSDB allows the artillery system to reach targets from significantly longer distances, and engage hard-to-reach targets, while maintaining the Small Diameter Bomb’s flight maneuverability and accuracy. 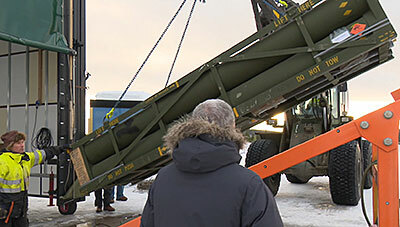 Under a teaming agreement signed last year, Boeing and Saab will offer GLSDB to current and future rocket artillery users. The rocket motor used during testing was provided by Nammo. «Saab and Boeing have a history of successful cooperation that now extends into yet another technology area – precision weapons systems», said Görgen Johansson, Head of the Dynamics Business Area within Saab AB. «Together, we now offer a new and game-changing capability for the U.S. as well as the global market». The Ground Launched Small Diameter Bomb revolutionizes rocket artillery. 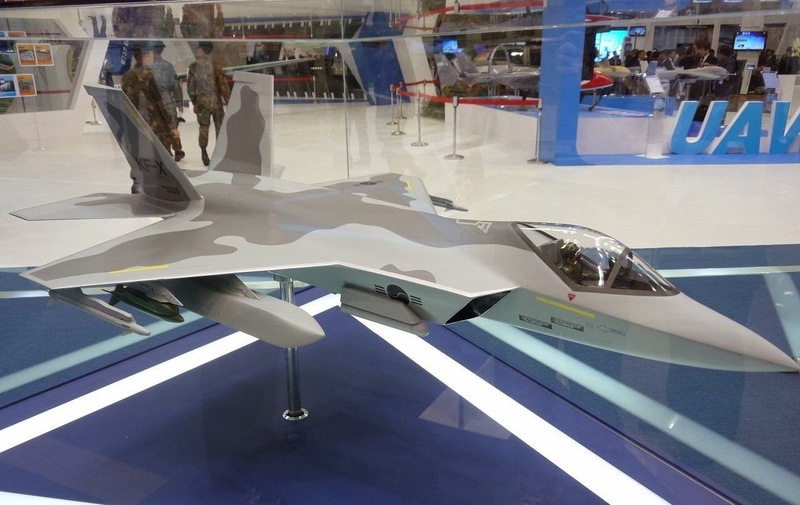 GLSDB will provide the warfighter with a long-range, precision fires weapon capable of conducting reverse slope engagements and defeating targets ranging from hardened facilities to soft-skinned assets. With 360-degree target engagement ability, GLSDB provides commanders and planners with a highly flexible weapon that complements existing ballistic trajectory weapons. GLSDB is an integration of combat proven systems, not a developmental program. It builds upon Boeing’s highly successful Small Diameter Bomb Increment I and existing Multiple Launch Rocket System (MLRS) rockets. The SDB I is a 250-pound/113.3-kilogram class weapon with an Advanced Anti-Jam Global Positioning System aided Inertial Navigation System, combined with a multipurpose penetrating blast-and-fragmentation warhead and a programmable electronic fuze. The result of this integration is an innovative, low risk weapon that provides significantly more capability over current MLRS rockets. More than 10,000 SDBs have been built at Boeing’s award-winning, modern production facility in St. Charles, Missouri. Since the first SDB delivery in April 2005, every weapon has been delivered on time and at cost. The Boeing Joint Direct Attack Munition Extended Range (JDAM ER) demonstrated significant range increase while maintaining its expected accuracy during flight-testing conducted by Boeing and the Royal Australian Air Force (RAAF). 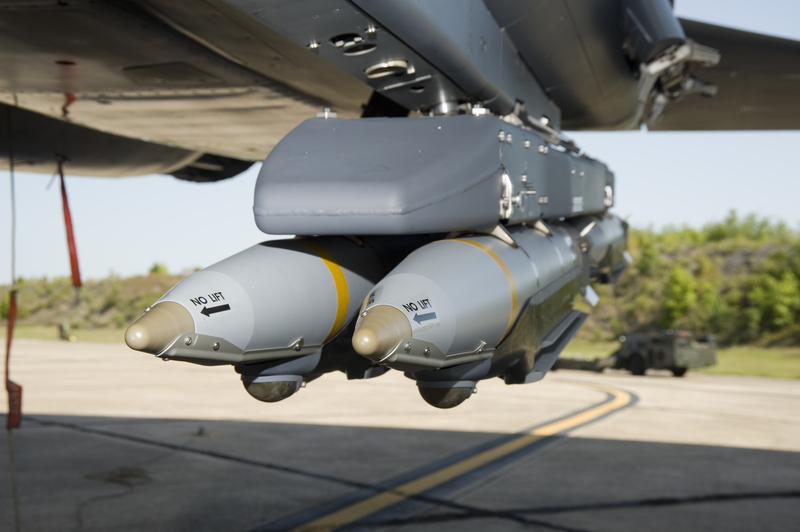 «The JDAM ER wing kit takes advantage of the conventional JDAM aircraft interface and Small Diameter Bomb glide technology», said Beth Kluba, vice president, Boeing Weapons and Missile Systems. «This keeps integration, development and sustainment costs low while bringing customers the range increase needed to neutralize current and future threats». «The extended range wing kit will allow the Australian Defence Force to employ JDAM more flexibly and safely in the target area», said Rear Adm. Tony Dalton, responsible for the acquisition of Guided Weapons in Australia. «Additionally, the program also stands to significantly benefit local Australian industry». JDAM is a low-cost guidance kit that converts existing unguided bombs into near-precision weapons. 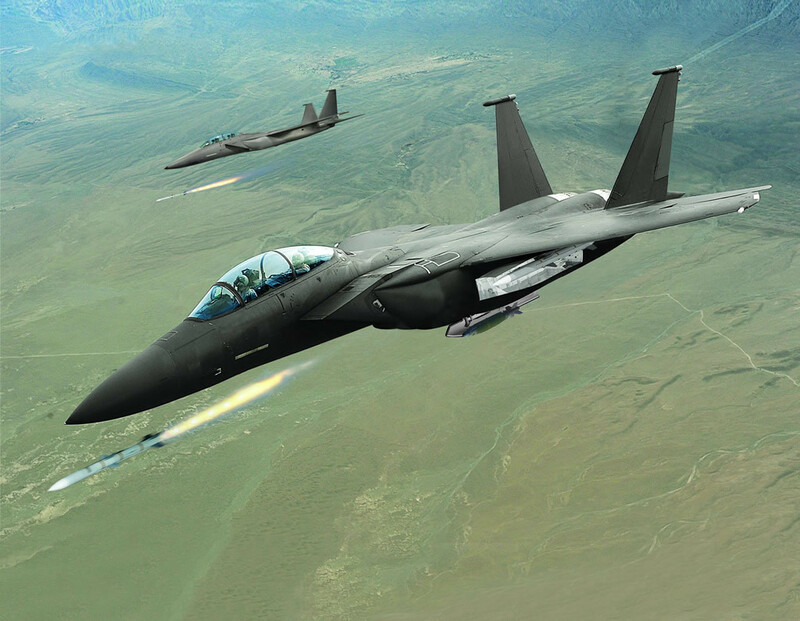 Including the JDAM ER wing kit, Boeing designed JDAM technology to accept a variety of upgrades such as a laser sensor, improved immunity to GPS jamming, and an all-weather radar sensor. 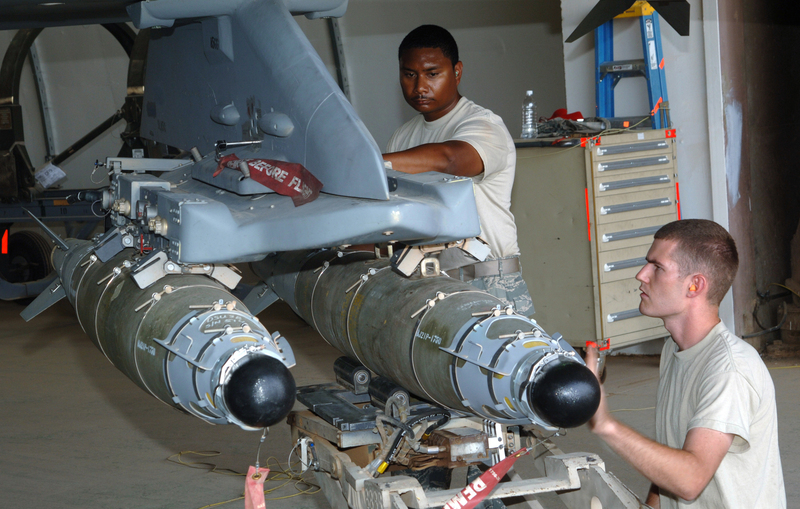 Boeing has built more than 260,000 JDAM tail kits in its Saint Charles, Missouri, facility since production started in 1998. JDAM is used by 27 international militaries. The Laser Joint Attack Direct Munition (Laser JDAM) expands the capabilities of the Joint Direct Attack Munition (JDAM). 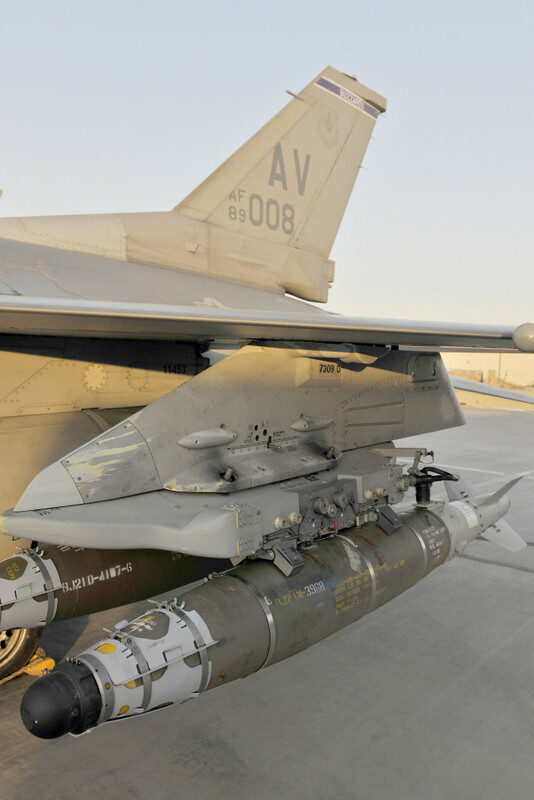 JDAM is a low-cost guidance kit produced by Boeing that converts existing unguided free-fall bombs into near-precision guided «smart» weapons. The JDAM kit consists of a tail section that contains a Global Positioning System/Inertial Navigation System (GPS/INS) and body strakes for additional stability and lift. Because of its modular design, an affordable laser sensor kit can easily be installed on an existing JDAM in the field within minutes. In addition to the outstanding all-weather GPS/INS capability that conventional JDAMs offer, Laser JDAM now adds the flexibility to prosecute targets of opportunity, including mobile and even maritime targets. U.S. Navy, U.S. Air Force and six international countries use the laser sensor kit on their JDAMs. Currently, tail kit variants are integrated with the Mk-84 2,000-pound and BLU-109 2,000-pound (900-kg) warheads (GBU-31). Mk-83 1,000-pound (450-kg) (GBU-32) and Mk-82 500-pound (225-kg) warheads (GBU-38) are in production to deliver the cost-effective JDAM. When employed, these weapons have proven highly accurate and can be delivered in any flyable weather. JDAM can be launched from more than 15 miles (24 kilometers) from the target with updates from GPS satellites to help guide the weapon to the target. Laser JDAM has been integrated with the GBU-38. Follow-on integration with the GBU-31 and GBU-32 is planned. Laser JDAM is operational on U.S. Air Force F-15E and F-16 and U.S. Navy F/A-18 and A/V-8B platforms. 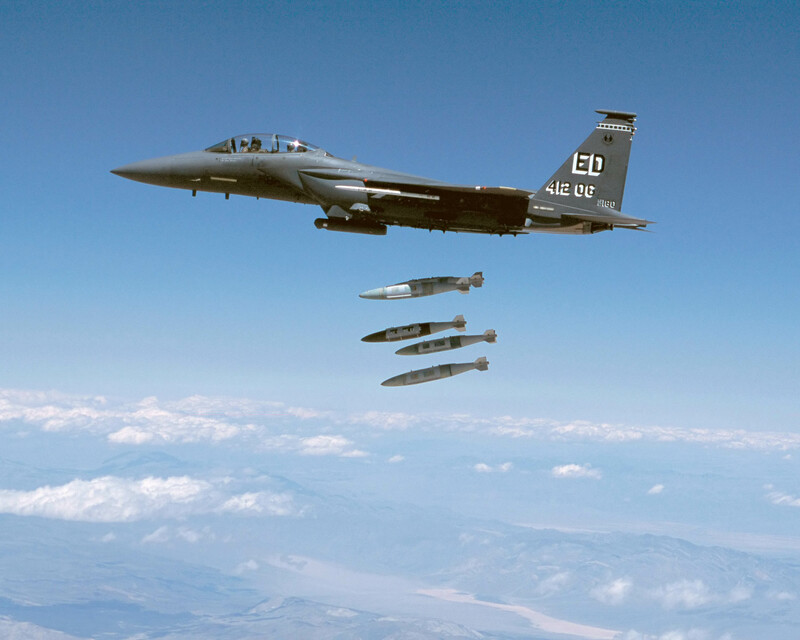 Boeing completed the Laser JDAM development and testing cycle in less than 17 months, and delivered the first production Laser JDAMs to the U.S. Air Force in May 2008. Laser JDAM was successfully employed in combat in Iraq in August 2008. The U.S. Navy’s first Laser JDAMs were delivered in October 2008. 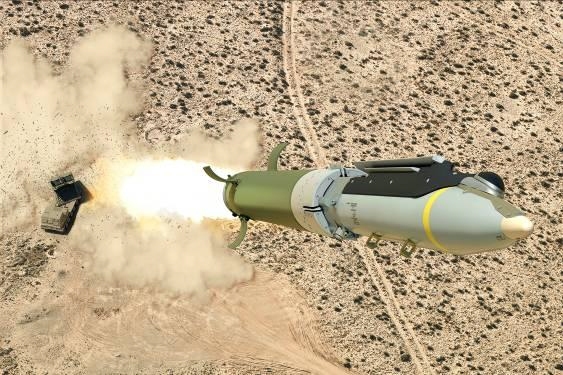 In March 2010, the Navy selected Laser JDAM to satisfy its Direct Attack Moving Target Capability (DAMTC) requirement. 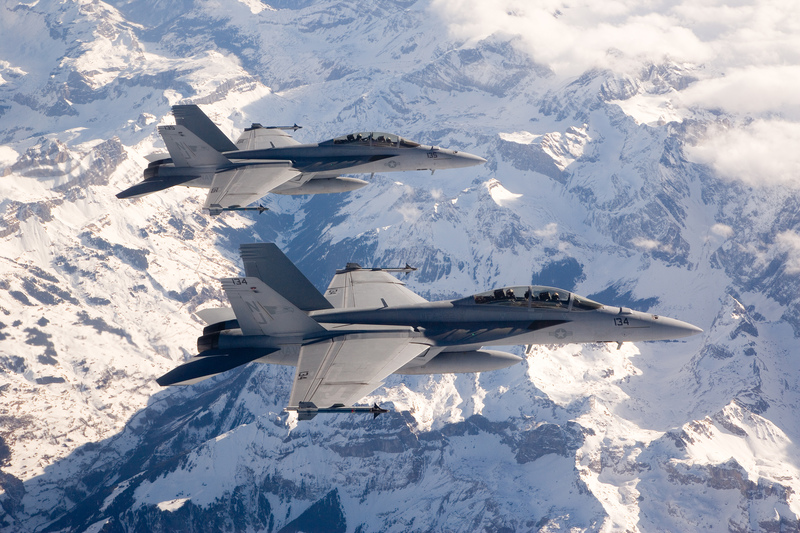 In September 2012, Boeing received a $22.7 million modification to an existing U.S. Navy contract for more than 2,300 Laser JDAM sensors, starting full-rate production in order to meet the Navy’s DAMTC program requirements. The Boeing KC-46 Pegasus development program completed its first flight of Engineering, Manufacturing and Development (EMD) aircraft №1 on December 28. Boeing EMD №1 is a provisioned 767-2C freighter and the critical building block for the KC-46 missionized aerial refueler. The maiden flight took off at 9:29 AM PST from Paine Field in Everett, Washington, and landed at 1:01 PM PST at Boeing Field in Seattle. «Getting in the air is a critical step in the development of this important capability for the warfighter», said Brig. Gen. Duke Z. Richardson, the program executive officer for tankers at the Air Force Life Cycle Management Center. «The team at Boeing has done a remarkable job creating an entirely new aircraft that will soon become the backbone of our ability to project power anywhere in the world». 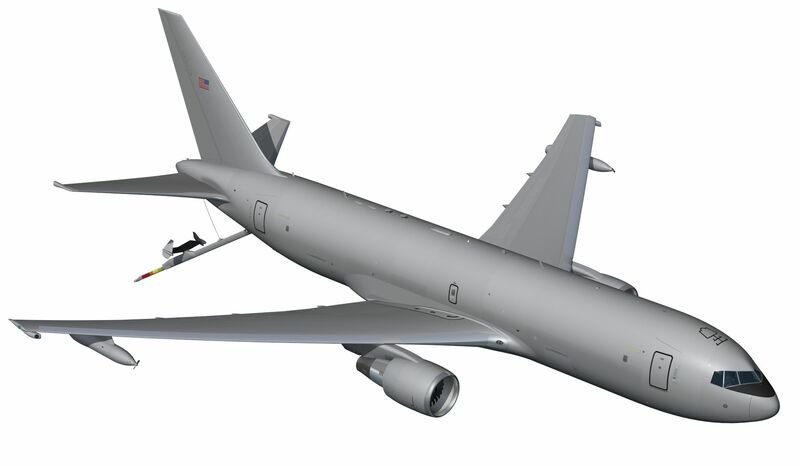 The 767-2C freighter is the initial step toward producing a KC-46. The aircraft will undergo additional finishing work s at the Boeing facility such as installing the refueling boom and other military specific equipment. 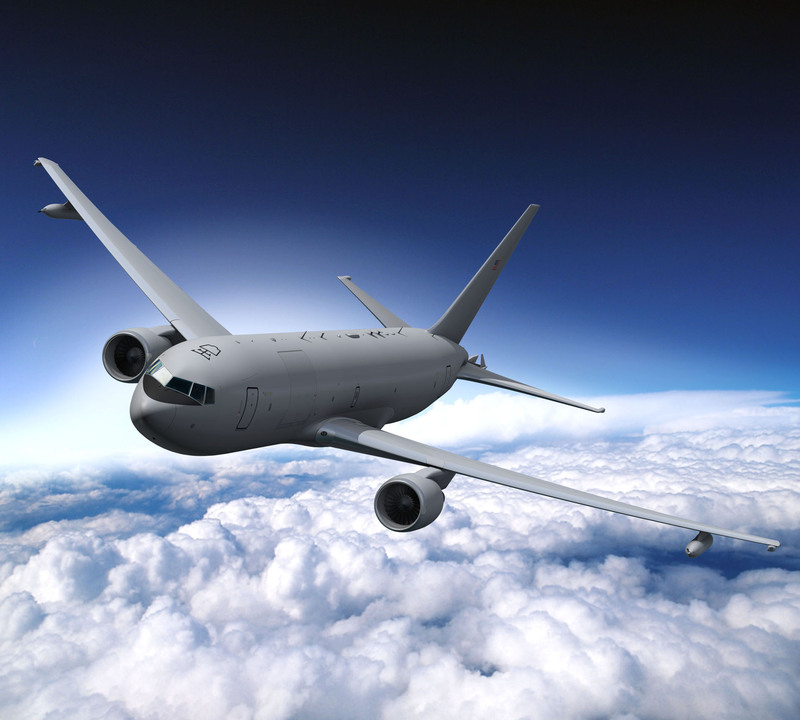 The first flight of a Boeing KC-46 Pegasus (EMD №2) is expected in the spring of 2015. «Today’s flight is a key step in the next generation of tankers», said Col. Christopher Coombs, the KC-46 system program manager. «We know flight testing will lead to some discovery; today’s flight kick-starts that work. There is an aggressive schedule going forward into the Milestone C decision point for approval to start Low Rate Initial Production (LRIP), but we remain cautiously optimistic we can meet the mark». The Air Force contracted with Boeing in February 2011 to acquire 179 Boeing KC-46 refueling tankers to begin recapitalizing the aging tanker fleet. This flight is an early but important step toward meeting the required assets available date – a milestone requiring 18 KC-46 aircraft and all necessary support equipment to be on the ramp, ready to support warfighter needs, by the August 2017 timeframe. 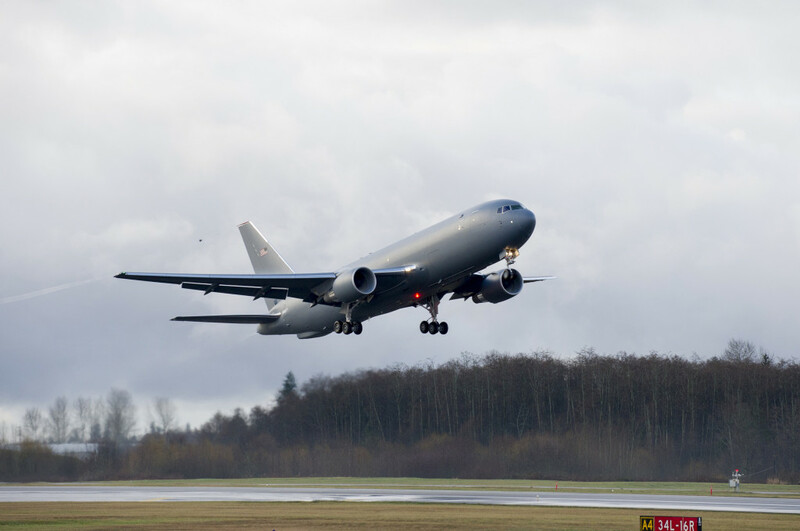 The Boeing KC-46A Pegasus is intended to replace the U.S. Air Force’s aging fleet of KC-135 Stratotankers, which has been the primary refueling aircraft for more than 50 years. 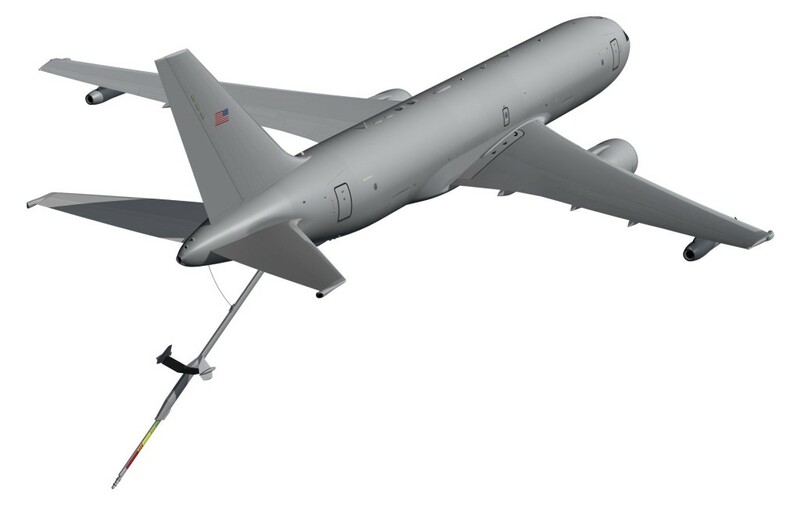 With more refueling capacity and enhanced capabilities, improved efficiency and increased capabilities for cargo and aeromedical evacuation, the KC-46A will provide aerial refueling support to the Air Force, Navy, Marine Corps as well as allied nation coalition force aircraft. The KC-46A will be able to refuel any fixed-wing receiver capable aircraft on any mission. This aircraft is equipped with a modernized KC-10 refueling boom integrated with proven fly-by-wire control system and delivering a fuel offload rate required for large aircraft. In addition, the hose and drogue system adds additional mission capability that is independently operable from the refueling boom system. Two high-bypass turbofans, mounted under 34-degree swept wings, power the KC-46A to takeoff at gross weights up to 415,000 pounds/188,240 kg. Nearly all internal fuel can be pumped through the boom, drogue and wing aerial refueling pods. The centerline drogue and wing aerial refueling pods are used to refuel aircraft fitted with probes. All aircraft will be configured for the installation of a multipoint refueling system. MPRS (Multi-Point Refueling System) configured aircraft will be capable of refueling two receiver aircraft simultaneously from special «pods» mounted under the wing. One crewmember known as the boom operator controls the boom, centerline drogue, and wing refueling «pods» during refueling operations. This new tanker utilizes an advanced KC-10 boom, a center mounted drogue and wing aerial refueling «pods» allowing it to refuel multiple types of receiver aircraft as well as foreign national aircraft on the same mission. A cargo deck above the refueling system can accommodate a mix load of passengers, patients and cargo. The KC-46A can carry up to 18 463L cargo pallets. Seat tracks and the onboard cargo handling system make it possible to simultaneously carry palletized cargo, seats, and patient support pallets in a variety of combinations. The new tanker aircraft offers significantly increased cargo and aeromedical evacuation capabilities. The aircrew compartment includes 15 permanent seats for aircrew, which includes permanent seating for the aerial refueling operator and an aerial refueling instructor. 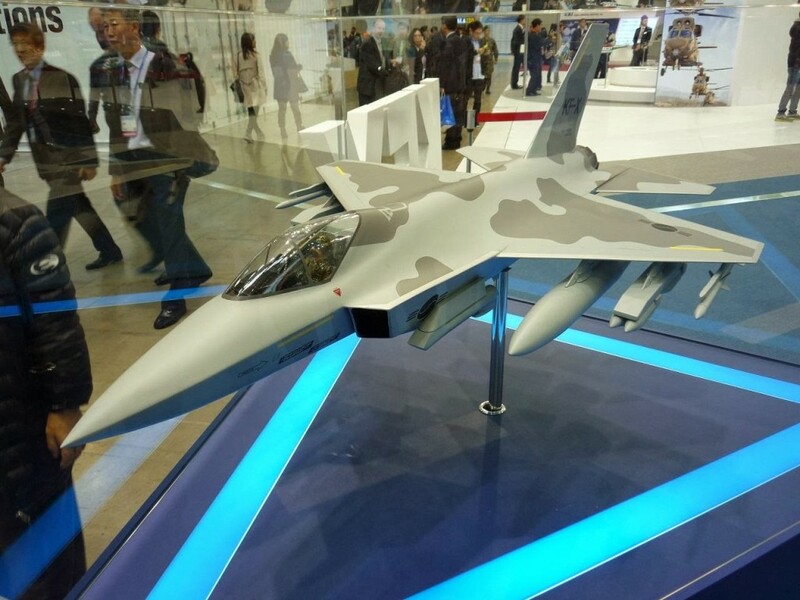 Panoramic displays giving the ARO (Aerial Refueling Operator) wing-tip to wing-tip situational awareness. The Boeing Company was awarded a contract for the EMD phase of the KC-46 program on February 24, 2011. The first flight of a Boeing KC-46 Pegasus (EMD №2) is expected in the spring of 2015. The current contract, with options, provides the Air Mobility Command an inventory of 179 KC-46 tankers.